It’s tough to tell if this was simply a quick response to the “When is multi-window coming to my device?” question that we are sure they get asked numerous times throughout the day or if they actually are going to bring in additional app support down the road. It would make sense for them to fully open it up to app developers. How much better would it be if you could use Chrome, YouTube, Gmail, and a favorite Twitter app at the same time? On a related note (pictured below), Total Commander works flawlessly with multi-window. Once downloaded from the Play store, it automatically appears in the list of apps for use with multi-window. 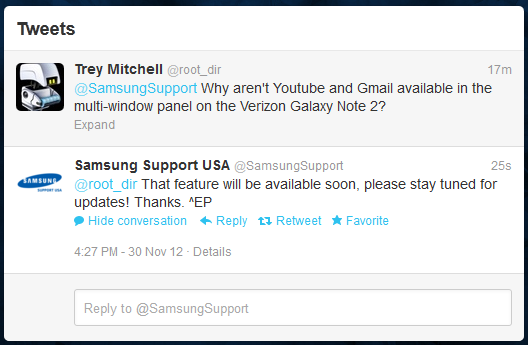 Does this mean that app developers can build in support without approval from Samsung? I’ll have to let developers answer that question. In the mean time, feel free to share any other apps that you find to work with multi-window.